*note– These are the Infinity Gems as they are represented within the comics, not within the Marvel Cinematic Universe. The way the stones look and function has since been updated by Marvel; keep reading for details. The Infinity Stones, originally referred to as Soul Stones, are six immensely powerful fictional gems appearing in American comic books published by Marvel Comics. Whoever holds all six Gems and uses them in concert gains omnipotence and omniscience. The six primary Gems are the Mind stone, the Soul stone, the Space stone, the Power stone, the Time stone and the Reality stone, and in later storylines, crossovers and other media, a seventh Infinity stone (Ego or Rhythm) is sometimes added. The Soul Gems first appear in The Power of Warlock. All six appear together for the first time in the second “Thanos War” storyline in Avengers and Marvel Two-In-One annuals. Thanos harnesses their latent energies to power a giant gem to extinguish every star in the universe. In the third volume of the Silver Surfer title, the Surfer refers to the gems as “Soul Gems” for the first time. They are gathered by the Elders of the Universe, who intend to use their combined power to drain Galactus of his life force and then recreate the universe with themselves as the oldest beings in it (Galactus was the last survivor of the Universe that existed prior to the birth of the current Marvel Universe). This plot is thwarted by the Silver Surfer, and several Elders and the gems are lost in a black hole; Galactus consumes some of the other Elders. In a follow-up story, Galactus is poisoned by the Elders he consumed. Silver Surfer, Mr. Fantastic, and the Invisible Woman journey through the black hole to recover the gems. Invisible Woman becomes possessed by the sentient Soul Gem, awakening her evil Malice persona. She is later subdued, and the gems are used to remove the Elders from Galactus’ body. The Elders later reclaim the gems. Each Gem is a small, smooth oval, and known by their respective powers. Each of the Gems represents a different characteristic of Existence and possessing any single Gem grants the possessor the ability to potentially command whatever aspect of Existence the Gem represents. The Gems are indestructible but not immutable. On two occasions one or more of the Gems have appeared in the form of deep pink spheres that were several feet in diameter. 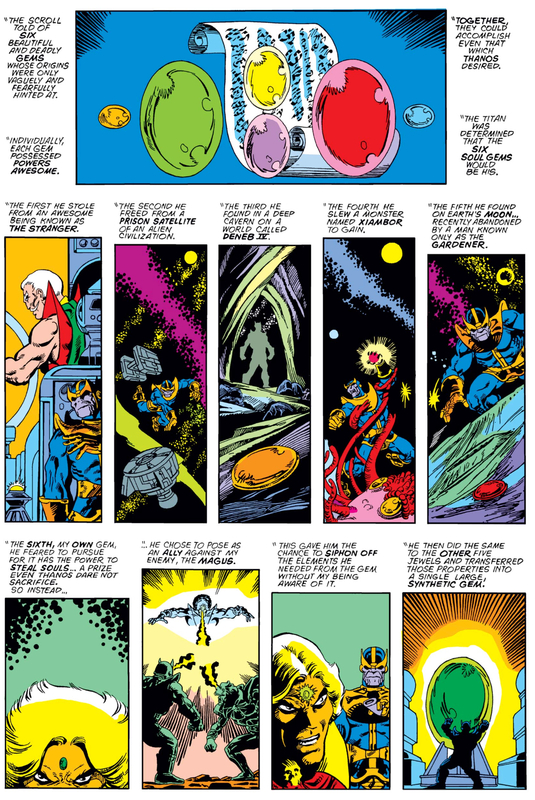 The Mind, Reality, Power, Space, Time, Soul Gems housed in the Infinity Gauntlet. On other occasions the gems have appeared in their normal shape but with different coloring (i.e. when the Soul Gem appeared to be red when worn by the Gardener). In the Ultraverse, the merged Gems, Nemesis, were once again separated after a climactic battle with Ultraforce and the Avengers. The Space, Power, Soul, and Mind gems morph into humanoid beings. The nature of these beings is not known, nor how these beings returned to their original forms. Thanos Steals the Soul Gem from the In-Betweener. Thanos Takes the Power Gem from The Champion of the Universe. Thanos Takes the Time Gem from The Gardener. Thanos Takes the Space Gem from The Runner. Thanos Takes the Reality Gem from The Grandmaster. 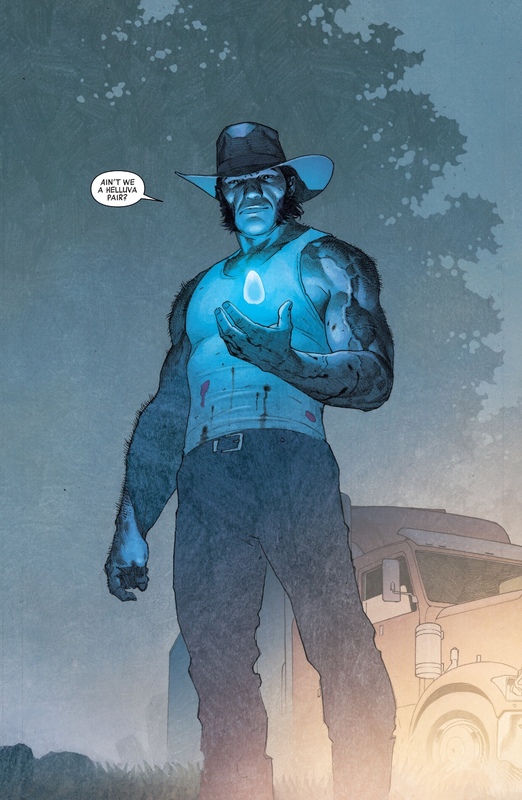 In Infinity Countdown #1 (2018) it looks like Marvel has changed the colors of the Infinity Stones to match their MCU counter parts and tweaked how they work. The stones (formerly called Gems) form a circuit when combined with each other forming a positive feedback loop unlocking their full potential and releasing the INFINITE power stored inside. The gems true potential lie within the users mastery of them individually. The stones have always been mysterious and a subject of debate and discussion for years so it’s fun to see them fleshed out a bit more. I prefer the still have a twinge of mystery, but that’s just me. • The Soul Stone is powered by the user’s mastery of Reality. It can preserve the soul to allow for life after death. • The Mind Stone is powered by the user’s mastery of Soul. It can grant telepathy, or intelligence. • The Power Stone is powered by the user’s mastery of Mind. It can make a person more physically powerful. Location: The desert planet of Xitaung. • The Space Stone is powered by the user’s mastery of Power. It can allow teleportation through space. • The Time Stone is powered by the user’s masteryof Space. It can allow a person to travel through time. • The Reality Stone is powered by the user’s mastery of Time. It can allow a person access to the Multiverse.